Clifford Clarkson is based in Buntingford, Hertfordshire providing services as a Portable Appliance Tester (PAT Tester). 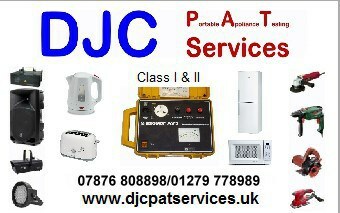 Portable Appliance Testing (PAT) - Class I & II - No call out charge - Available Monday to Sunday, day & night. We are able to test the following items Lights - LED Lights - Laser Lights - Mixers - Active Speakers - Smoke Machine - Haze Machine - Bubble Machine - Monitors - Snow Machines - Low Fog Machines - Projector - IEC Leads - Extension Leads - Power Supplies Fridge/Freezer - Fridge - Freezer - Toaster - Kettle - Tumble Drier - Dishwasher - Washing Machine - Iron - Microwave - Electric Oven - Fan - Fan Heater Drill - Sander - Angle Grinder In fact anything electrical. What you will receive - PAT "PASS" Labels on main appliances, a Full Equipment List, a Pass Certificate and a listing on our website with a QR Code linked directly to it, very convenient if you are asked and do not have a copy with you. Clifford Clarkson does testing on Every Day. We are available to test during Normal Business Hours, Evenings and Weekends although do contact us if you need Testing outside of the above, as we may be able to assist. Clifford Clarkson accepts the following payment facilties: Cash, Invoice, Bank Transfer, Debit/ Credit Card, PayPal. Please feel free to call me on 01279 778989 07876 808898, or use the contact form below to give me details of your location and equipment and allow me to quote.